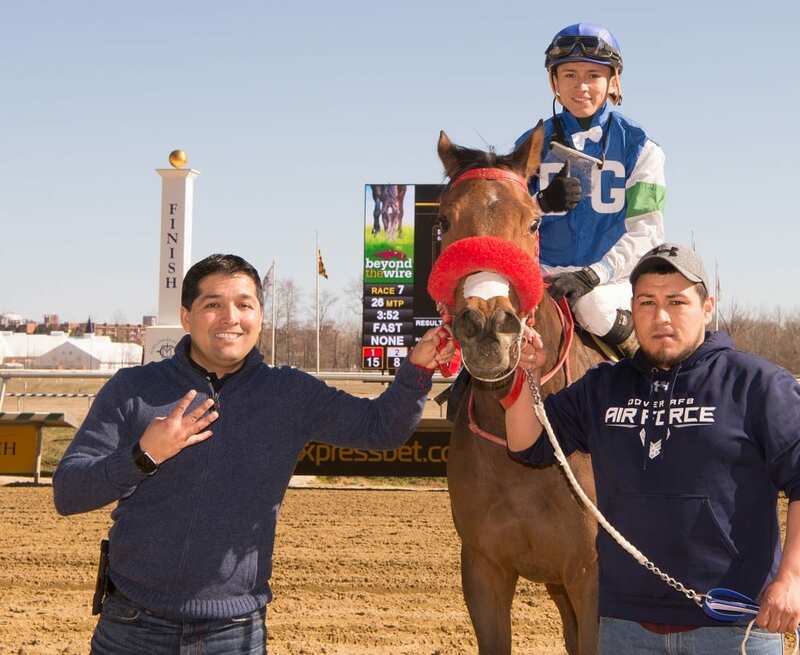 Claudio Gonzalez won four races at Laurel Park on Sunday. Photo by Jim McCue, Maryland Jockey Club. For jockey Horacio Karamanos, one win sounded pretty good on Sunday at Laurel Park. Meet-leading trainer Claudio Gonzalez didn’t stop till he got to four. Sue Mancilla’s Sebray ($18.40) captured Sunday’s seventh race, a $19,000 claiming event for 4-year-olds and up, to give journeyman Horacio Karamanos his first win since returning from injury over the weekend. Karamanos, a perennial leading rider in Maryland who earned his 2,000th career victory last summer at Laurel, suffered a minor fracture of his T-5 vertebrae when thrown from his mount, Marie From Parie, Jan. 14 at Laurel. He began getting on horses again last week for trainer Mary Eppler at Palm Meadows, Gulfstream Park’s satellite training facility in Palm Beach County, Fla., returning to the irons March 16 at Laurel. Gonzalez, Maryland’s leading trainer in 2017, captured back-to-back races with Pachi Cruze ($9.80) in the second and Hashtag Selfie ($2.80) in the third. He followed up with wins in the fifth with Young American ($4.40) and Mischief Maas ($3.80) in the sixth, also running second with Candycoated Dame. In the fourth race, Gonzalez finished second with Miss Nosy, favored winner of the Maryland Million Distaff last fall. Gonzalez leads the winter-spring meet with 24 wins, 10 more than runner-up Kieron Magee. Gonzalez is also first with $689,490 in purse earnings.